Elliptical machines are one of the great pieces of cardio workout equipment whether to exercise at your home gym or at commercial fitness centers. With different types are available, Magnetic Elliptical Trainers are now becoming the most preferred choice for every health enthusiast. However, the magnetic cross trainers are quite expensive but are supposed to be more beneficial over the belt resistance type or air resistance type elliptical machines. What are Magnetic Elliptical Trainers? Magnetic Elliptical trainers or cross trainers are the most qualitative fitness equipment that comes with two types of magnetic resistance. The Standard Magnetic Resistance and The Electromagnetic Resistance. 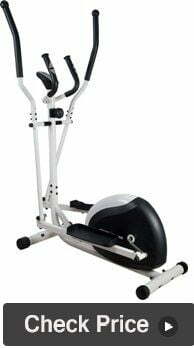 Magnetic Elliptical Trainers that uses standard magnetic resistance comes with a very powerful magnet that creates resistance while moving away from or towards a flywheel. The amount of current generated increases as the magnet gets closer to the flywheel and this creates resistance. On the other hand, the magnetic elliptical trainers that use an electromagnet are positioned near a flywheel to provide resistance. Electromagnetic brake systems allow the users to control the resistance by simply pressing buttons on the console or handlebars. It means with just the simple touch of a button; the machine can direct more current to the magnet for more resistance. And also reduces the current for less resistance. This mechanism is also known as eddy current resistance or eddy current braking. Magnetic Elliptical Trainers are the most common and even the smoothest type of brake and resistance system. To get the more clear idea on Magnetic Elliptical Trainers, check our Buying Guide Section. 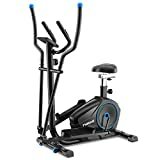 With an affordable price range, this is one of the best magnetic elliptical trainers for an effective cardio workout at home. Not only comfortable and easy to use but also packed with a lot of awesome features that anyone can use it very comfortably. It comes with a double direction 8 Kg flywheel as well as 8 level of tension control. The handlebars are equipped with hand pulse feature to measure your pulse rate while doing exercise on it. The belt-driven non-skid pedals are there that can easily accommodate your feet size for the comfortable and safe exercising experience. This magnetic cross trainer also comes with a big LCD display that shows your speed, distance, time, calories burned, and pulse rate. And this way you can track your stats and then increase or decrease your aerobic capacity accordingly. 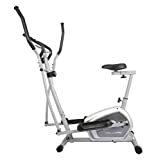 If you are looking out for an elliptical trainer that can easily accommodate in a limited space and even without compr16mising the quality and performance, then this one is an ideal choice. The Iris Fitness Magnetic Elliptical Trainer comes with a lot of smart features for a great workout from the comfort of your home. Featuring a precision balanced flywheel and V-belt derive, this cross trainer offers the most smooth and quiet operation. With its 16 level of magnetic resistance control, you can easily change your workout level accordingly to meet all your fitness goals. The smart LCD digital monitor is also equipped with this cross trainer that lets you track your fitness stats like distance, time, scan, calories burned, and speed, and target zone heart rate. For those who are highly concerned about fat burning and ultimate cardiovascular endurance, this one has a built-in hand pulse sensors to monitor and maintain a steady target heart rate. For comfortable workout experience, this magnetic elliptical trainer comes with a big non-slip pedal that increases stability and comfort. Even the stride length of 16 inches provides you a non-impact and smooth full body workout. 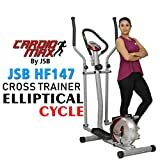 This multifunctional exercising machine from Excel is another best choice for a magnetic elliptical trainer at best price. This magnetic orbitrek comes with no chain and offers four types of exercising at the same time including air walking, stepping, cycling, and swimming. The machine is equipped with a digital meter to show your speed, distance, time, calories, and pulse rate. It also allows the easy adjustment of resistance through the tension control knob and is features with 8 levels of tension control for a smooth whole body workout. This model is a little bit heavy and great for commercial uses like gyms, and fitness centers. But also if you have enough space, you can keep this great piece for your home gym also. The other smart features include anti-slip foot pads, both forward and backward pedaling support, and low-high resistance settings and a lot more. For an incredible cardio workout results from the comfort of your home, this magnetic cross trainer from Powermax is one of the best choice. It comes with an 8 kg flywheel for the most smooth and quiet operation. For a number of lower and upper body workouts, this elliptical machine is absolutely a great buy. It comes with a smooth and silent belt transmission system and micro-adjustable tension control knob. Also, it is driven by the fan wheel chain mechanism along with a two-way three-piece crank system. This magnetic cross trainer is also equipped with a large LCD display showing your vital readings including speed, distance, time, and calories burnt. The adjustable seat option provides you with a soft and comfortable feel. Even the foot pedals come with the anti-slip feature. In terms of safety, this machine comes with convenient knobs to stop the machine in case of emergency. So, bring this machine to your home gym and ensure a great aerobic fitness and efficient fat burning for a perfect workout. 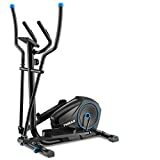 This magnetic elliptical trainer from the brand Propel is an excellent buy to accelerate weight loss and burn more calories. With a lot of decent features, this magnetic cross trainer offers you an effective full body workout. The machine features a large LED with Matrix Display that lets you track your progress and shows your fitness stats like speed, distance, time, calories, burnt, and pulse. Even there comes the built-in workout program that lets you meet your fitness goals. This exercise machine comes with 8 levels of resistance that you can adjust accordingly for the different type of workouts at different levels. The stride length is 18 inch that is pretty good enough for the most comfortable and smooth workout experience. It comes with the stainless steel handlebars featuring foam grip and heart rate sensor to calculate your heart rate while exercising. The pedal features anti-skid hard fiber material for comfortable movement of legs. How Magnetic Elliptical Trainers work? Magnetic Elliptical Trainers or cross trainers are the stationary piece of exercising machine that comes with two long handles and foot pedals. You can experience the same movement pattern when walking, running, and climbing stairs while doing exercise on it. And thus, this great piece offers a full body workout at the same time. Magnetic Elliptical Trainers, also known as Silent Magnetic resistance because of their quiet and noiseless working operation. The working mechanism of magnetic elliptical machines involves a magnetic field that creates magnetic currents and produces friction by pushing it against the flywheel. You can increase the level of resistance by exerting more energy to the foot pedals and this way the magnetic field is getting stronger. Space- Thinking about the machine for a better cardio workout? Yes, magnetic elliptical trainers are the best choice. But think what if you haven’t enough space for its storage. So before buying an elliptical for your home, it is very much important to consider the actual space in your room so that you can use it comfortably. Even check for the ceiling too, as the elliptical trainers add a few feet to your height. And so the high-ceiled rooms are ideal to keep the elliptical. Quality- Quality is yet another important factor of consideration. Go for the branded ones always. The sturdy and strong magnetic elliptical cross trainers are the best choice to use the machine for long run. Stride Length- For average height people, it is better to go for the machine with 18-inch stride length. Although, if you are over 6 ft, you must opt for the 20-21 inches stride length machine. The elliptical trainers for commercial use come with 21 inches stride length that can easily accommodate all height people. Foot Pedals- Choose the machine with non-slippery foot pedals with raised edges and can easily accommodate your foot size for a comfortable workout. Maximum User Weight- Go for the magnetic cross trainer that can bear a maximum weight load. Size and weight of the flywheel- For a smoother and steadier workout experience, it is better to opt for the machine with large and heavy flywheel. Some Extra Features- The advanced models of magnetic elliptical cross trainer come with a built-in heart rate monitor. Even some of the machines also have integrated programs based on your heart rate that lets you exercise at the right level. Some also have Wi-Fi feature, fitness tracker apps and various motivational software that makes your workout fun. Well, this is all about our best picks of magnetic elliptical trainers in India that you can buy online for an effective cardio workout. These pieces are surely a great buy whether it is fitness centers, commercial gyms, or even for your home use also. So, why don’t you invest in one of the best pieces that we have mentioned in the blog? Pick your favorite one right now and meet all your fitness needs.